Time for something light and lemony. And what could be lighter and more lemony than a lemon soufflé? 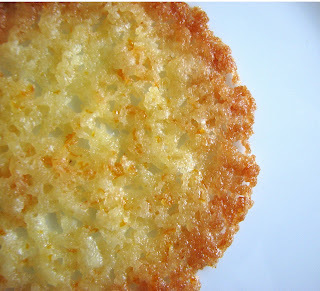 I really love hot soufflés for their texture and subtle deliciousness. 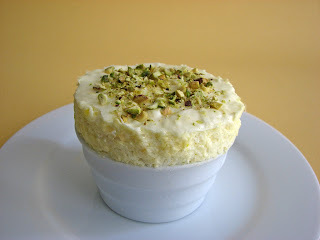 But rather than having to fret about planning and preparing to serve a soufflé straight out of the oven, here is a cold lemon soufflé that can be prepared well ahead and simply pulled out of refrigeration and delivered to the table without interrupting the flow of lingering over that last bite and sip. This preparation is not terribly complicated, but it does require you to be organized. The method is similar to a bavarois or Bavarian cream: you’ll need to act quickly once the base is prepared. The cream and the egg whites should be whipped and waiting to be folded in just as the base is starting to set up. And there will definitely be more than one bowl to wash, but that shouldn't stop you. This dessert is definitely worth the dishpan hands. Sometimes you may have a craving for a bold and intense dessert. Other times you may wish for a whisper of a treat, one that will not clobber you over the head. This is that dessert. Simple, tart, tangy, light and lemony. - The soufflé achieves its lofty height with the assistance of a paper collar. Just cut a strip of parchment or waxed paper or foil a couple of inches longer than the circumference of the ramekin. Fold the strip in half lengthwise and secure it with tape. The collar lets you fill the dish above the rim, allowing this frozen dessert to have the same look as a traditional baked soufflé. You can also skip this part and simply fill the ramekins to the top and smooth over with a metal spatula. - There are alternatives to the packets of gelatin that you find at the grocery. I prefer gelatin sheets that I've used in professional kitchens. They have no odor and are very easy to use. A packet of gelatin is 1 tablespoon, or the equivalent of four sheets of leaf gelatin or 1 T of agar agar. Fit four 1-cup ramekins with a paper collar if you want the soufflé to set up higher above the rim. Whip heavy cream until soft peaks form. Set aside in refrigerator until needed. Place the sugar and lemon zest in a food processor and blend until the zest has been finely ground. Combine lemon sugar with egg yolks and lemon juice in a mixer bowl. Place the mixer bowl over a simmering pan of water, stirring slowly and continuously until sugar is dissolved and mixture is hot. Beat on medium high until the mixture lightens, triples in volume and forms a thick ribbon when beaters are lifted. This will take about 10 minutes. While lemon mixture is beating, sprinkle the gelatin over 1/4 C water to bloom. Heat over simmering water until the gelatin dissolves. When the egg yolk mixture ribbons properly, pour the liquefied gelatin into the egg yolk mixture and beat until combined. Nest this bowl in a larger bowl partially filled with ice water and stir gently until it begins to thicken, about 5 - 8 minutes. Meanwhile, whip the egg whites until stiff peaks form. Set aside. When egg mixture has started to thicken, carefully fold in the whipped cream in thirds, then fold in the beaten egg whites. Scoop into the ramekins, smoothing tops. Refrigerate until firm, about 2 hours. 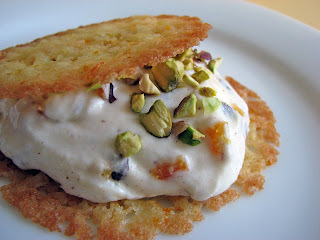 When ready to serve, garnish with pistachios if desired. 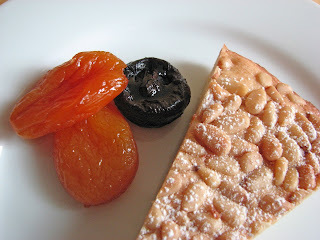 Desserts in Tuscany tend to be quite simple and rustic but are nonetheless extraordinary in taste and texture. 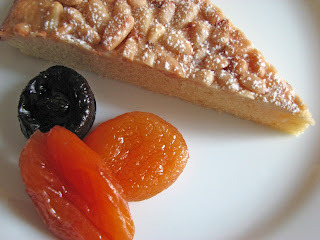 Many Italian desserts feature nuts as a central ingredient and today's little cake is no exception. 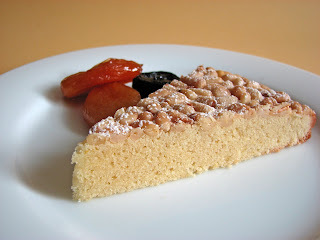 Pine Nut Torta is a delicate and gorgeous escapade into the Italian landscape that will fill you with appreciation for the simple and elegant things in life. On a recent journey through lots of recipe press clippings and food magazine remnants, I came across this recipe and immediately put it near the top of my list. I love pine nuts and since fresh fruit pickings are pretty slim this time of year, the accompanying autumn fruit compote sounded especially welcome. This recipe is easy and the whole thing comes together in a cinch. The result is a buttery sliver of a cake that is not too sweet. Although it's full of pine nut richness, it has the quality of being rather light. And the scent of roasting pine nuts wafts through the kitchen as the torta bakes. The fruit compote is a delicious dessert in its own right and would also be great with ice cream. Pine Nut Torta with Marsala-Poached Autumn Fruit is the kind of dessert that calls for a crackling fire and all the time in the world. 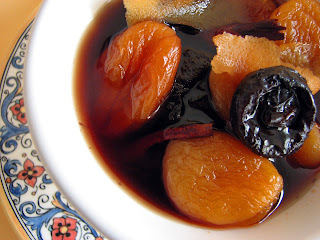 - If you have a thing about prunes, substitute your favorite dried fruit. Dried cherries would work well. The compote can be made 2 days ahead. Store in an airtight container in your refrigerator. Bring to room temperature before serving. - Marsala is a wine produced in Marsala, Sicily. Be sure you purchase sweet Marsala for desserts rather than dry Marsala, which is often used in savory dishes such as Chicken Marsala. - Suggested baking time is 30 minutes. However, my oven does run hot and my torta baked in 20 minutes. Start checking it at 20 minutes to be sure you don't over bake. 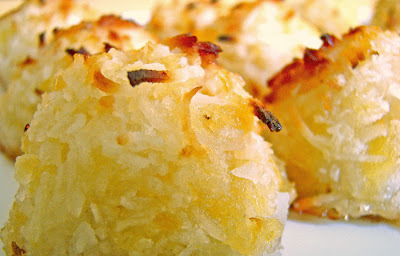 It should be a light, beautiful golden color with some browning at the edges. A tester should come out clean. Combine Marsala water, sugar, cinnamon stick and lemon peel in a saucepan. Bring to boil to dissolve sugar. Lower heat, add dried fruit and simmer about 25 minutes until the fruit softens. The fruit should retain its shape and not be mushy. Remove fruit to a bowl. Bring the sauce to a boil and reduce until syrupy, about 5 minutes. Pour syrup over fruit. Preheat oven to 375°F. Butter and flour a 10-inch-diameter springform pan. Whisk together egg yolks, egg and salt. Add lemon zest and vanilla and blend thoroughly. Slowly add flour, mixing until it begins to resemble coarse meal. Gently stir in egg mixture and using a rubber spatula, fold together until just combined. The batter will be thick. Pour into prepared pan and smooth batter. Sprinkle the top evenly with pine nuts and press gently a bit to be sure they are embedded in the batter. Bake until tester inserted into center comes out clean, about 20 - 30 minutes. Cool on a rack. Run thin-bladed knife around edges to loosen and remove the springform ring. Cool completely. Torta can be made 1 day ahead, covered and stored at room temperature. Sprinkle with a very light dusting of powdered sugar. Serve with fruit compote. Since so many regions are in the midst of a cold snap, it might be a good time to take a little detour to the tropics. 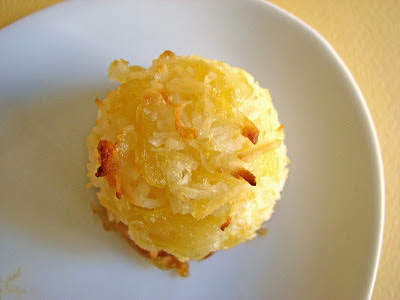 How about a romp-on-the-beach mixture of coconut and pineapple in the form of an old-fashioned cookie? Most of us know about macaroons, those chewy nuggets chock full of coconut. 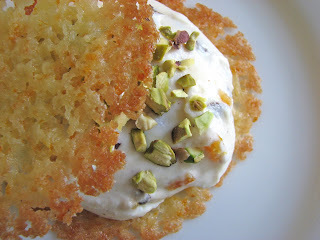 This is just a little twist on that theme I found in a cookbook by David Lebovitz. I was late to the coconut party, probably because I was always thinking of the coconut from my childhood, a way-too-sweet product that never seemed to have its own flavor beyond that powerful knockout slam of sugar. But now that we can find unsweetened coconut in health food or bulk groceries in most places, we can enjoy its true natural flavor. Far from being the coma-inducing coconut cookies of another era, these offer a more pure coconutty taste. 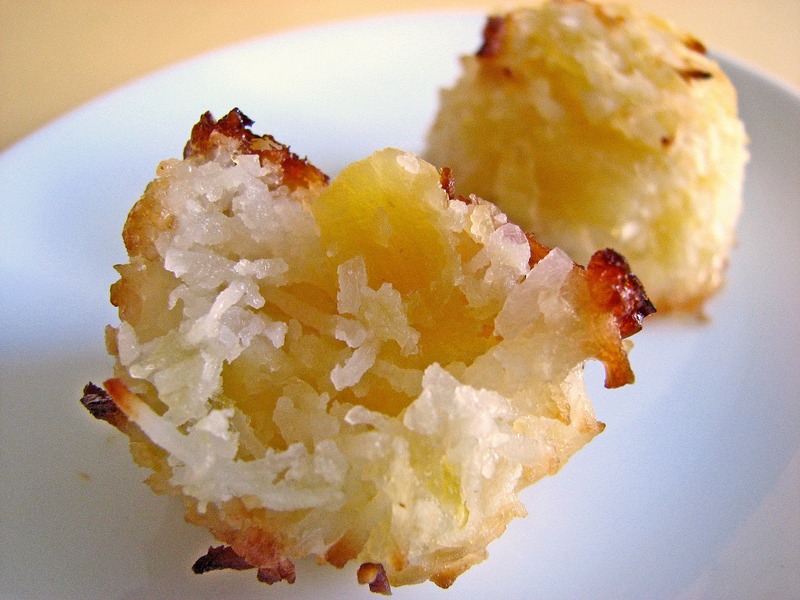 The addition of pineapple to a traditional macaroon adds a wonderful tartness and tropical flavor to the whole experience. David's recipe calls for canned pineapple. In fact, he goes so far as to admonish us not to frown on canned pineapple and to “get over it.” Since I always follow a recipe religiously at first trial, I went with that despite my own natural inclination and mantra to use the freshest ingredients. I followed his instructions and the results were as promised. However, I am nevertheless absolutely tempted to use fresh pineapple when I have the chance. Next time. If any of you beat me to it, please leave a comment! - It’s very important to heat the pineapple and its juices until the liquid is fully evaporated. If not, the mixture will puddle when scooped and placed on the baking pan and the bottoms will burn. 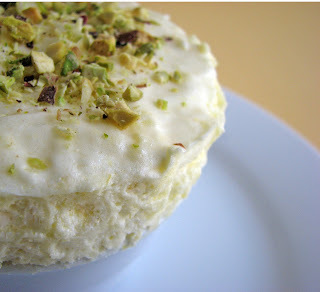 - The mixture can be stored up to 5 days in an airtight container in the refrigerator to bake as you go. - I'd be tempted to cut back a bit on the sugar next time. But that would depend on whether I was going to use fresh pineapple and how sweet it might be. Preheat the oven to 350 degrees. Prepare a sheet pan with a silpat or parchment paper. Place the crushed pineapple along with the juice and the sugar in a large skillet. Heat through and stir constantly until the liquid has evaporated and the pineapple begins to get sticky and caramelized. Be careful to keep stirring so it doesn’t scorch. 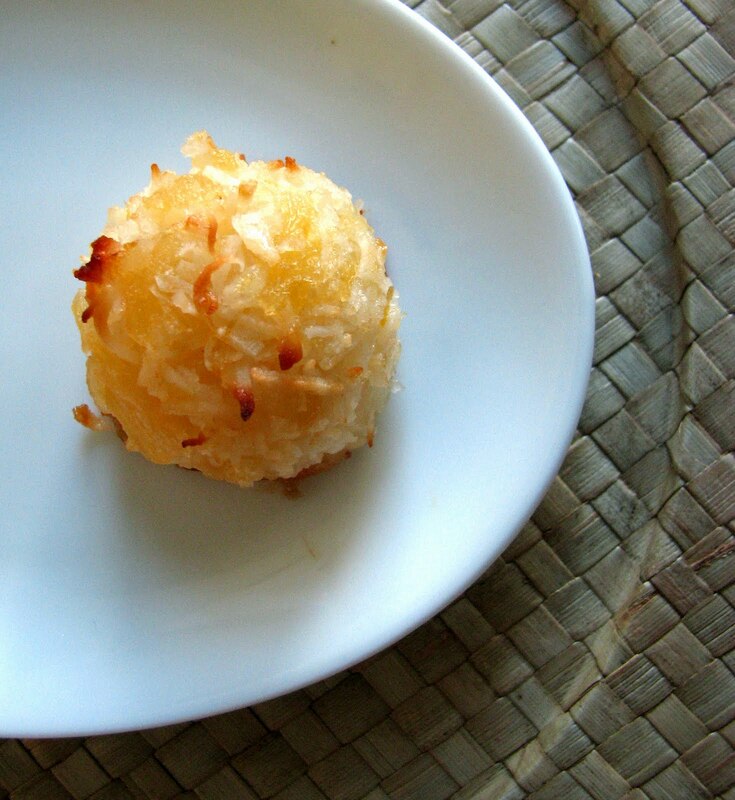 Transfer to a mixing bowl and combine with coconut. Add the egg whites and vanilla and mix thoroughly. Scoop about 2 T onto the baking sheet, spacing 12 per baking sheet. I use a small ice cream scoop #40 (the #40 refers to 40 scoops per quart). Bake for 12 – 15 minutes on the middle rack or until cookies are slightly browned, rotating the pan half-way through to ensure even baking. Cool completely. These are best eaten the same day. They can be stored in an airtight container for a few days but will soften. When premium chocolate began to appear everywhere and we were able to enjoy really high quality products, many chocolatiers began to produce lots of different flavored and spiced truffles and bars. Some of these experiments were a little off, but many were surprisingly delicious, opening up a new world of recipe development for chefs the world over. One of the combinations that struck me as interesting was the use of curry with chocolate. It brings a very warm and complex element to the mix, so I thought I’d have a go at a little combination of my own. I start with master baker Flo Braker’s fabulous Devils Food Cake, which is achingly tender and brimming with the glorious flavor of good cocoa. Unlike Angel Food Cake, which is light and airy from the use of egg whites, Devil’s Food Cake is a butter cake that is dark and rich without being heavy. 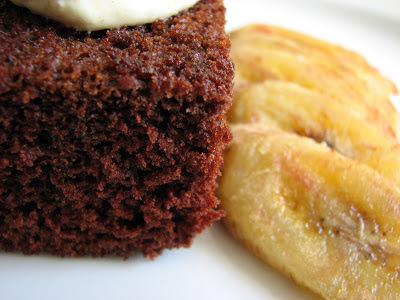 Both cakes were conceived in the early 1900’s and both are still American favorites. 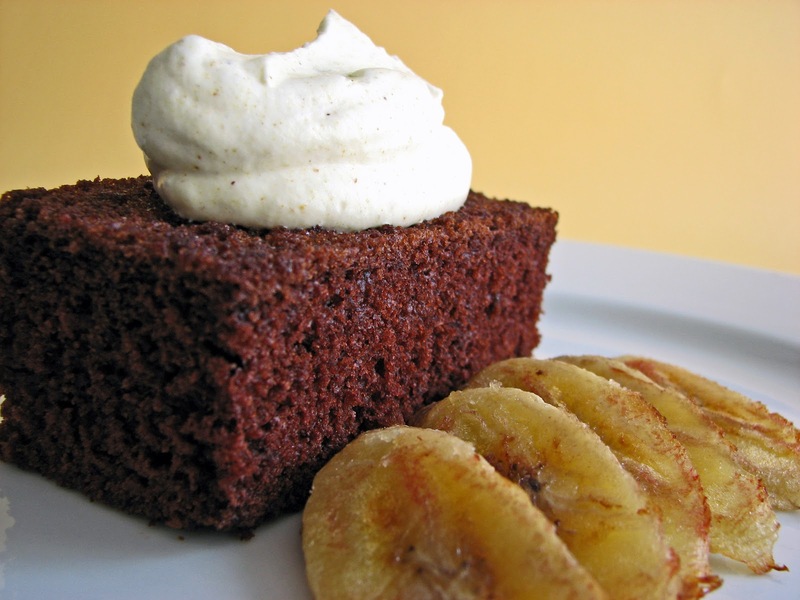 To the cake I add an array of sautéed bananas and a dollop of curried and sweetened whipped cream. Pretty simple, fun and very satisfying. - The composition of curry is as individual as a recipe for mole. Use your favorite blend and vary the amount according to your taste and the freshness of your mix. 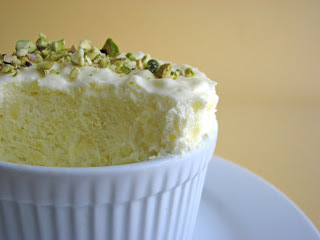 Start by adding a bit of curry to the sweetened cream and taste. Keep going until the flavor suits you. - If you don't have buttermilk on hand, you can substitute 1/4 C whole milk to which you have added 3/4 t of white vinegar or lemon juice. 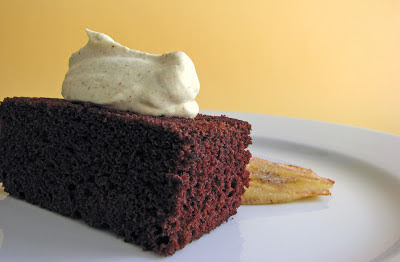 - Double the cake recipe and you have the makings of a great layer cake. Finish with ganache and you’re set. Preheat your oven to 350 degrees. Prepare an 8” cake pan with butter, parchment and a light dusting of flour. Gently add dry ingredients in 3 additions, alternating with buttermilk, beginning and ending with the dry ingredients. Stop mixing just before it is fully blended and finish by folding gently with a rubber spatula until there are no streaks. Be careful not to overmix. Pour into prepared pan and smooth batter evenly. Slice bananas. Melt butter and add sugar. Add bananas and sauté a few minutes over low heat until softened just a bit. 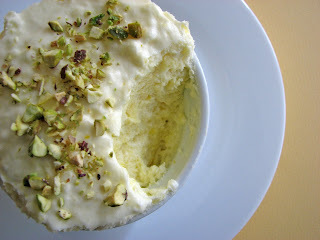 Combine cream and sugar and curry powder to taste and whip to soft peak. To assemble, plate a piece of cake and garnish with bananas and cream.